ACTORS + DIRECTORS CALL-OUT FOR PAGE TO STAGE, WED 26 NOVEMBER! Page to Stage comprises directed, rehearsed readings of four new theatre scripts, followed by feedback from an industry panel. Cast and director meet on the night, with an hour to rehearse. The event allows plenty of opportunity to meet people (including a venue with all-day menu, cask ales etc.). As this is a networking evening, run on a voluntary basis, all roles are unpaid. See below for play summaries and casting breakdowns. Applications welcome from all backgrounds. – Casting is done using your CV, biog and any other information you supply. – Please apply for roles you feel you are most suited to. – Where ages are not given, there is scope for casting to be wider ranging. – Actors confident playing up/down in age are welcome to apply for older/younger parts. – Please send a short note outlining relevant experience, along with your biog and CV. 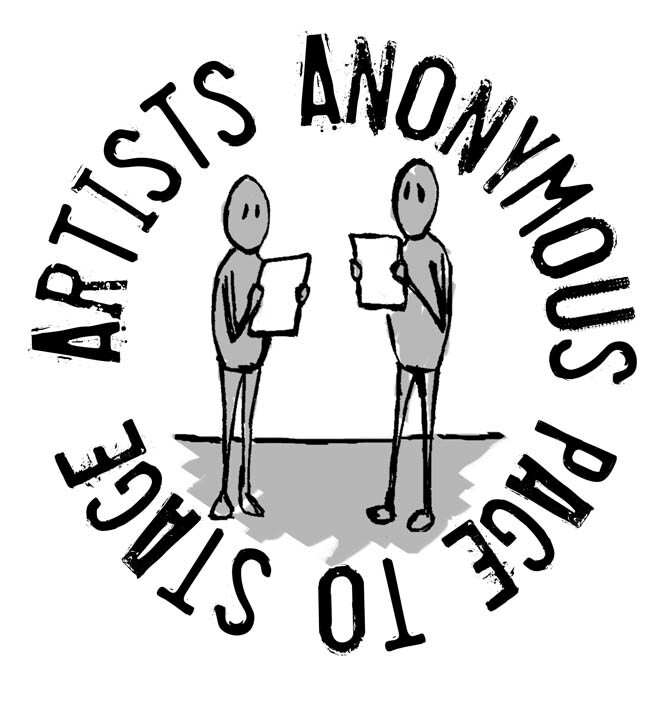 Deadline: Please email your CV and biog (75 words max) to london@artists-anonymous.org by Monday 17 November. Mark (M): 40s. Likes to be in control. Tense at opening of play. Janice (F): late 20s. Paranormal investigator. Smart. Fights her corner. Patrick (M): late 20s. Salsa teacher. Angry for much of this piece. A father and daughter fight to redeem their relationship after making some shocking discoveries. Haidi (F): teenager. Exasperated by her dad but close to him. Dad (M): middle-aged. Came out. Can’t believe his little girl is growing up. Sam is an ordinary office worker, frustrated by his irritating and prejudiced colleagues. Laura (F): late 20s. Assertive, attractive, educated. Graham (M): 30s, Boastful, arrogant. Sam (M): 20s. Introverted, reliant on technology, deluded. Melanie (F): late 30s/early 40s. Nosey, embittered. Melissa (F): any age. Intelligent, not really expecting much from the dating site. Steve (M): any age. Plays many roles on the dating site. Hi – I’d like to be considered for Mark. I’ve just finished at Theatre503 where I played a lord breaking up with my feisty Brazilian wife, whilst standing in a bin? Thanks Thomas – if you could send me your CV, biog etc. to the email address in the post, that would be great. I am finalising the casting today, so I’d be grateful if you could send your info through a.s.a.p. I am interesting to get involve Catfish and Kill-colleaguez.com..
Would you mind to tell me where is the auditions will take place, and when, please. All the information you need is in my post. There are no auditions – as I say, casting is done by CV (headshot, credits, showreel link etc,), biog and any other information you wish to supply. The email address is supplied in the post.